Whah! Lightfest month already? Where did 2014 go?!! Is that second panel sunrise or is Skarva just that angry? Both. You see, the sun is created each day from a pure concentrated ball of Skärva’s orange fury. As he gets tired in the evening, it disappears. So does that mean all of Skarva’s minions are Sunbros? Noooo, not the paper, those cost .25 ides each! And it’s not like those things grow on trees or anything. Idenau’s most powerful villain once again proved no match for the Hero of the God, who successfully completed another Quest over the past several days, delivering a punishing defeat to Tiberius Skärva the Fourth last night. The princess displayed uncharacteristic passion while denying rumors that she gave Blank a kiss on his big long nose. Continued on page b3. That sword directly to the face looks to be healing nicely. Now I’m curious, if magic potions are delicious milkshakes what ARE health potions. Obviously not literal hearts of minions like Link eats, judging by the non-grimdark tone of The Fourth, but maybe they’re something non-delicious and healthy that don’t heal wounds like a healer, such as tofu? 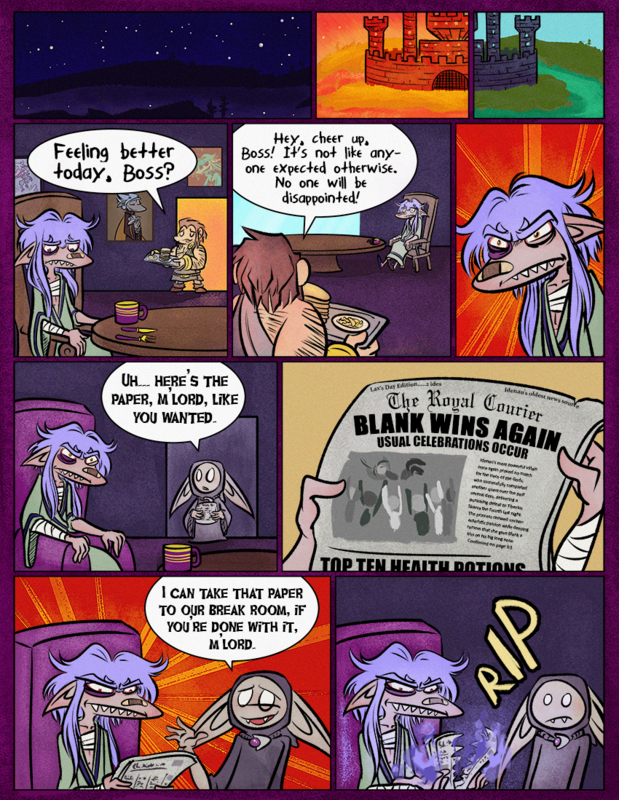 Which would make Blank have super health powers relative to everyone else in the world, who go down in 1-3 hits always, and have to heal the hard way. Oh no I think the newspaper forgot to give Skärva the dots over the a. No wonder he got mad. I would think health potions would be just liquid infused with healing magic. Magic potions are meant to provide calories, which can then be converted into mana; health potions would just be a way to store and administer a certain kind of magic. Looking at that headline, it’s obvious that there are differences in the precise composition of the liquid medium used, because otherwise health potions would differ only in the amount of magic in them, and it’d be meaningless to list them in order of quality. Of course, this is all just my theory. Also, Blank’s big long nose sounds like an euphenism. And now that I’ve seen it that way, I can’t unsee it. This is not pleasant at all. I’m here assuming a health potion is a magical healing potion, like in any D&D-inspired RPG you can name. Potions that are good for the health would be a different matter. But really, as if Blank has a big, long, uh… nose. Why do you think he has such a big sword? Compensating much? Potions tend to be something like a generalized medicine/pain reliever. They can help you heal faster, but it would be more effective to have a healer actually work on you. There are lots of different kinds of health potions, some made by healers with magic infused into the substance itself and others made with ingredients that have natural magic or medicinal properties. Healing magic itself still requires knowledge of biology, and through research and experimentation, health potions have been developed that can specialize in certain areas. I dunno, me and Victor just like the idea that even in a world with magic, it’s still beneficial and necessary for society to learn science. The article is probably pointing out the best potions (in the writer’s opinion) for a variety of categories. Also, I imagine healing potions are more effective on Blank. While he doesn’t have his own magic, he has the blessing of the gods which causes magical items to interact with him in special ways. Those are eggs, haha. Although maybe it is macaroni. I don’t know what Skärva’s favorite comfort food is… he’s a lord, he can eat whatever he wants for breakfast. And yeah, I thought about adding the dots but thought it was more realistic for a newspaper story that had to be rushed out to have a typo, heh. He ripped it with magic? That’s a bit extravagant…or is he too weak to rip it on his own? I think the R.I.P. was not for the paper but for Skarva’s hopes and dreams. Skärva and his many faces of scowl to communicate. He could write a book about scowling. A picture book! With only pictures of him scowling. He would scowl out advise like “grow a second set of eyebrows for an extra angry visage!” but it would just be a page with his face frowning intensely and glaring. Poor Skärva looks so weak… Make him better, somebody! If only there was someone who cared about him and was like, absurdly good at healing. But there doesn’t appear to be anyone like that around. I think Skarva is mad just because the pie from the last page was all gone when he was finally hungry for some. Not because Blank beat him for the 100th time again. He got use to that.